This dream-weaving collection of beautiful music is the ultimate sleep cure for adults and babies alike. The angelic voices of Melodia perform songs by Franz Schubert, Gustav Holst, Ned Rorem, Johannes Brahms, Eric Whitacre and others in this relaxing CD. 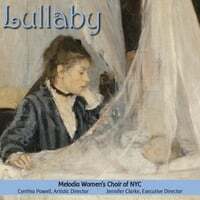 Melodia, New York City's premiere women's choir, has embarked on our first professionally-produced recording project—a collection of gorgeous lullabies. Founded by Jenny Clarke, Executive Director, in 2003, Melodia Women's Choir explores and performs rarely heard music for women’s voices in many different styles, and nurtures emerging women composers through commissions, residencies and performances. Under the direction of Cynthia Powell, founding conductor and Artistic Director, the 32-member choir has performed at Symphony Space, Merkin Concert Hall, Church of Saint Ignatius Loyola in collaboration with Sacred Music in a Sacred Space, and the Surrogate’s Courthouse as guest artists at Women History Month Celebrations for the NYC Comptroller. We have been heard on WQXR - The Choral Mix with Kent Tritle, on WNYC radio, and most recently on WQXR/Q2 “Her Music – 24 hours of emerging women composers,” and seen on NBC TV. Over the past 11 years, Melodia has performed many beautiful pieces of music that are perfect for lullabies—dream-weaving pieces for women's voices by the likes of Franz Schubert, Gustav Holst, Ned Rorem, Eric Whitacre, Charles Villiers Sanford, Veljo Tormis, Paul Csonka and Johannes Brahms. We decided it's time to collect all of these into one CD to be enjoyed by all. Babies and grown-ups will enjoy relaxing to these restful melodies. "Lullaby is really lovely. So well produced and Melodia sounds just inspired. "My only quibble with Lullaby is that I didn't feel sleepy at all. I couldn't wait for the next track." "I love the CD. Really, a lovely production." "The music is so beautiful and ethereal." "I'll be buying Lullaby CDs for holiday gifts this year!"